The 2018 promotional calendar includes 16 fireworks nights, 25 giveaway items, and much more! Catch the Sounds family affordable entertainment at just $10 for general admission tickets. Buy Dog Tickets for Tonight! Limited dog tickets available (200) for tonight. Buy online to avoid getting turned away. All-you-can-eat food and unlimited drinks is only the beginning of the Nashville Sounds' version of a backyard cookout. The popular Club Level Cookout option returns for Easter Weekend (April 20 & 21)! The full promotions schedule for the 2019 season is here and First Tennessee Park's fifth season features 15 fireworks shows,15 great giveaways and four themed weekends. 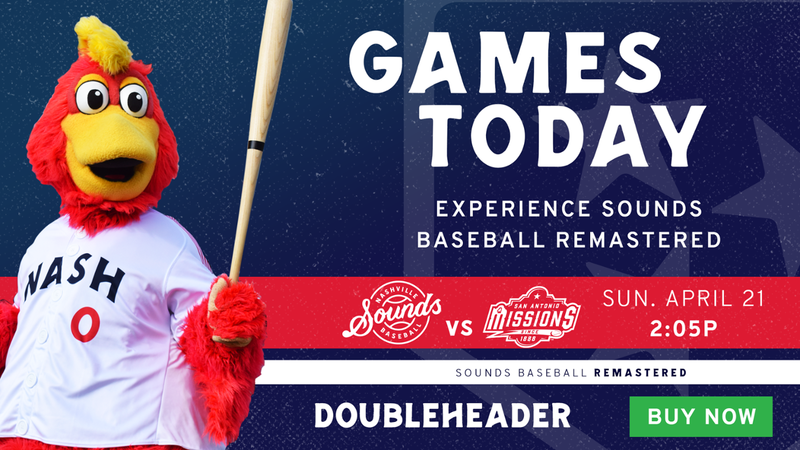 Get the best deal for the Sounds vs. Rangers Exhibition Game! A bundle ticket includes: a Club Level Seat, all-you-can-eat food & drink (that includes beer!) and a limited edition tee. With the Opening Day Remastered Bundle, fans score an Opening Day ticket for April 4 with an All-You-Can-Eat Picnic, Postgame Fireworks, Throwback Thursday drink specials and much more! Join the Nashville Sounds for Opening Day 2019 as Nashville hosts the Iowa Cubs on Thursday, April 4 at First Tennessee Park. Have baseballs delivered to your inbox by signing up for the Nashville Sounds enewsletter. You'll receive updates about upcoming games and promotions every week! Innings make great outings! Whether you have a small group of 20 or a large group of 600, the Sounds have something for everyone. Choose from one of our premium group areas, an outfield picnic, or book a group block (20 guests or more) in the ballpark's Dugout, Select, or Corner sections! Today is Tito's Tail Waggin' Tuesday! With limited availability (200 per Tuesday), buy your dog ticket online to avoid getting turned away! 2019 Opening Day is right around the corner as the Sounds are set to host the Iowa Cubs on Thursday, April 4 at First Tennessee Park. Who Are The Remastered Sounds? We pulled from our baseball forefathers to create a classic look for our team. But even more important than the look, is what it represents. The Nashville Sounds unveil four new looks the team will be wearing in 2019 to represent our city at First Tennessee Park and across the Pacific Coast League. Nashville is more than Music City. We have deep musical roots, but the Honky Tonks of Broadway only define part of this place we call home. The Sounds transform into Viheulas de Nashville from May 3-5. Purchase the Vihuelas Bundle or take home the Sugar Skull Bobblehead on Sunday, May 5. The Sounds Pro Shop is fully stocked with all of the necessary apparel and headwear to "remaster" your current Sounds wardrobe. The Nashville Sounds emerge from the studio this offseason to debut a remixed and reworked identity in 2019 to better showcase Nashville's version of the American pastime. On November 15, the Nashville Sounds are hosting a logo and uniform reveal party at First Tennessee Park. We've got six solid reasons why you won't want to miss it. The Nashville Sounds 2019 schedule is here! The action all starts on Thursday, April 4 when the Sounds host the Iowa Cubs to begin the 2019 campaign at First Tennessee Park. View all the important dates today! The Nashville Sounds are seeking part-time, game-day employees for the 2019 season. Fill out the application at the link and email your completed form back to info@nashvillesounds.com. We will follow up by contacting you for an interview. October is for baseball and the MLB Postseason! Each of the 10 clubs in the postseason has at least one former Sound on the roster either as a player, manager or coach. Join Sounds Broadcaster Jeff Hem as he explores former Sounds in the NLDS and ALDS match-ups. All-you-can-eat food and unlimited drinks is only the beginning of the Nashville Sounds' version of a backyard cookout. The popular Club Level Cookout option returns for the Sounds September 2 & 3 games! On Monday, September 3, our friends at Eisenberg Hot Dogs are presenting Dollar Dogs at the concession stands for fans to enjoy, as the Sounds take on the Memphis Redbirds and wrap up their 2018 campaign. Place a Season Ticket Member deposit and receive a special invitation to the inaugural Swing For Your Seats event on Friday, September 7 from 5:30-9:30 p.m. where you will have three swings to win season tickets by hitting a home run at First Tennessee Park. The Nashville Sounds Camo game-worn jerseys are available at auction beginning today at 10 a.m.! Jersey auction sales benefit Operation Homefront. The auction concludes Sunday, September 2 at the end of the sixth inning. Winning bidders in-ballpark will receive their game-worn signed jersey on the field post-game. Have Sounds baseball delivered directly to your inbox and never miss out on all the fun taking place at First Tennessee Park! The free, easy way to convert everyday purchases into Nashville Sounds tickets, merchandise, and refreshments. Pro tips on saving money at the ballpark.